Looking back to December of 1965 when the United States Airforce presented to Dayton a fighter jet for display in our town. 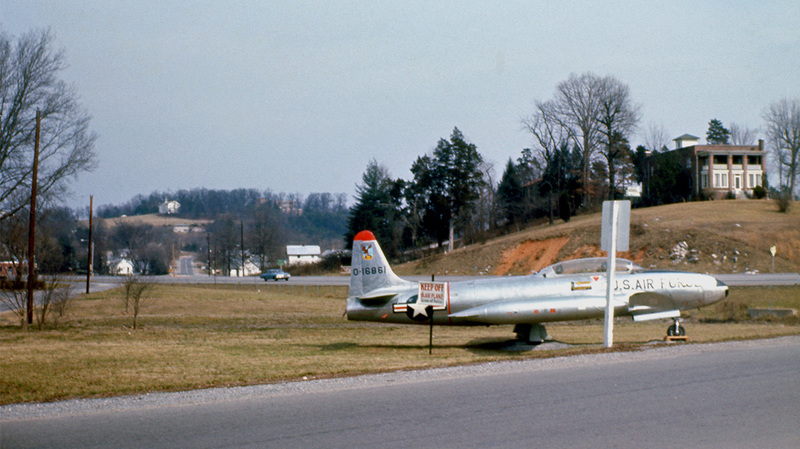 The jet airplane was a T-33 and would be placed on a historical display in the park in downtown. Col. Joseph L. Sullivan, Commander of Stewart Air Force Base at Smyrna, Tennessee made the official transfer of ownership to Charles Walters, Mayor of Dayton, as a crowd of youngsters climbed all over the plane. Those present were Walter Cheers-City Attorney, Sam Morgan-Chairman of the Dayton Lions Club, Bill Voigt-Public Relations Director for the city, Everett Beene-Minister of the Church of Christ who gave the invocation at the ceremony, Kelso Ballard-City Commissioner, and Jerry Bivins-President of the Dayton Lions Club. 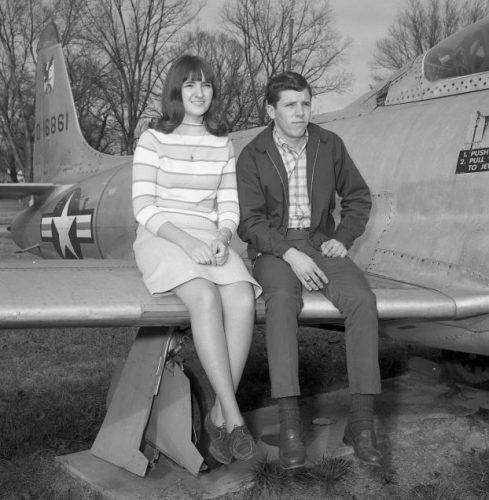 Throughout the years, town’s folk enjoyed the aircraft, children played on it, and many Rhea High School students used the plane for a prop and had yearbook photos made on the plane. 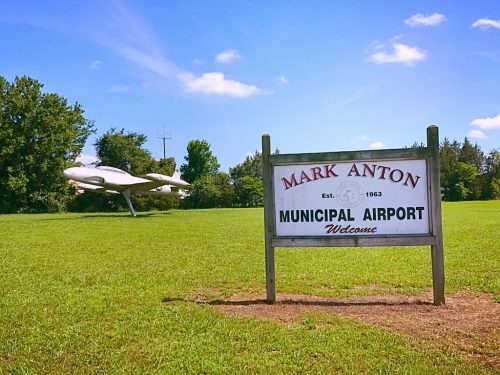 In the late 70’s, the Dayton City Council voted to move the aircraft out to the Mark Anton Airport, to allow for addition park space which was needed. Suburban of Dayton made a steel pedestal and City workers move the aircraft and mounted it on the pedestal at the entrance to the airport where it remains today. The T-33 Jet is the trainer version of the F-80, the first U.S. Jet fighter Plane used in combat during the Korean War. History of the Aircraft shows that on December 23, 1965 be it known now and forever after, that the United States Air Force has given full title and ownership of the Lockheed T-33 number 51-6861 described hereafter in an Historical outline, to the City of Dayton, Tennessee. Background Data: The T-33 T Bird made its first flight in 1948. It is the trainer version of the F-80, the first United States Jet Fighter used in combat during the Korean War. The T-33 has dual controls and ejection seats and was originally designed to give future Air Force pilots the feel of handling larger and faster aircraft. It is currently being replaced in the Air Force’s Pilot training program by the T-38 Talon. Specific Primary Function: Administrative aircraft and proficiency pilot trainer. This aircraft was turned over to the Airforce by Lockheed Aircraft Corporation on the 10th day of October in 1952. At that time, it was assigned to the 3550th training wing, Moody Air Force Base in Georgia. On the 22nd of March in 1954, it was Transferred for Air Force Liaison duties to the Oakland Airport in Oakland, California. On the 25th of May in 1954 The T-33 returned to the south and was assigned to the 5th combat crew training wing at Tyndall Air Force base in Florida. It trained with the 3625th until the first of May 1956, when it again crossed the United States and returned to Oakland Airport for Air Force Liaison duties. On the 16th of June in 1956, it returned to the 3625th combat training wing and remained with that unit until the fifth of February 1959. On that day February 1959, it was transferred to the 3625th Technical Training group also stationed at Tyndall Air Force Base in Florida. The commander of the 3625th Technical Training Group flew the aircraft to Craig Air Force Base in Alabama, to preform temporary duty with the 3615th flying training wing. He returned with the aircraft on the 20th day of February 1959. On the 2nd of October 1959, control of the aircraft was assumed by the 3631st Support Squadron, also Based at Tyndall Air Force Base. It remained with the 3631st until the 8th of April 1960, when it returned to its old unit, the 3625th Technical Training Group. On the first of April 1964, the aircraft was assigned to the 4756th Air Defense Wing at Tyndall Air Force Base as an Administrative Support Aircraft. Here it remained until it was declared excess to the Air Defense Commands inventory of Aircraft and flew its last mission to Stewart Air Force Base in Tennessee, for demilitarization in preparation for presentation to the City of Dayton. In 13 years, service to the United States Air Force Number 51-6861 flew a total number of 6, 711 Hours. After 25 years in Fire/EMS in Dayton, Dean now owns and operates his own photography business, Memory Lane Photos.Dean works hard to preserve the history of Rhea County for future generations to enjoy. Online news coverage for Rhea County, Tennessee since 2013. Home warranty: saving headaches or a non-justified spend?